Kieran McAnespie had pretty much a full squad to choose from and opted to leave Del Hepburn on the bench preferring Chris Black’s endeavour against a physical Hurlford side. Alan Vezza was also making his 150th appearance for the club. The first half rarely saw either keeper being tested. The Bankies enjoyed decent possession, but it was Hurlford who carried the bigger goal threat. Clydebank gave umpteen free kicks away allowing the home side the opportunity to fire cross balls into the box for their tall, powerful front line. This is something that will need to be guarded against in the replay as this is Hurlford’s main tactic. Both of the Caddis’ had attempts on goal in the first ten minutes but both shot harmlessy wide, and there were several ongoing dangerous moments that took last gasp clearances from the aforementioned free kicks into the box. It took the Bankies half an hour to register a decent attempt on goal and it could have resulted in a goal. Jordan Shelvey sent Nicky Little clear on the left hand side with a neat flick. Little seemed to rush his shot and sent it high and wide. If that chance could have been a goal, then Cammy McClair should have scored two minutes later. A cross from the right was mis-cued by Chris Robertson in the box, and the ball fell perfectly for McClair around ten yards out. With the whole goal to aim for, he blasted the ball over the bar. A further two minutes on, and Hurlford had their nearest chance of a goal. Another troublesome free kick was fired into the box. This time the Bankies struggled to clear the ball and McKillen got his head on it. With Waters out of position it was left to Vezza to head the goalbound effort over his own crossbar. 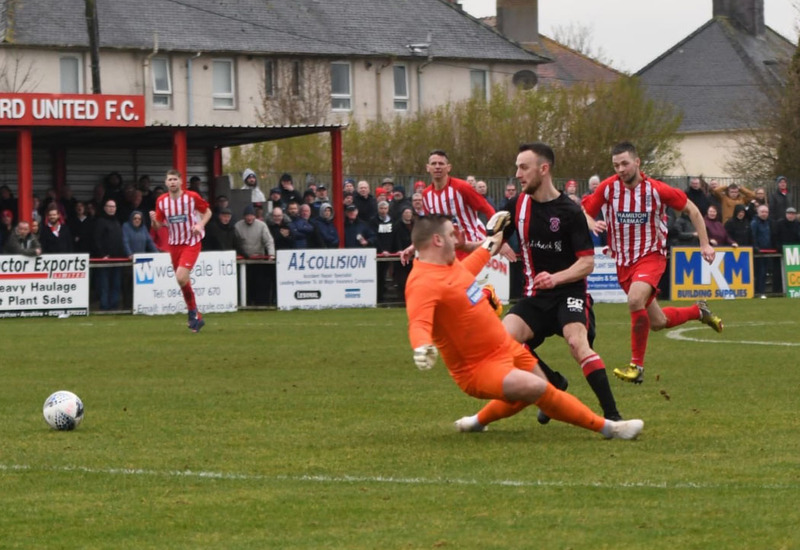 Hurlford set about the Bankies goal with more urgency at the start of the second half and had the ball in the net, but Waters was clearly infringed upon. Clydebank weathered this early pressure and imposed themselves in the perfect way by opening the scoring. Nicky Little’s through ball clipped a defender on its way setting up Jordan Shelvey perfectly. The Bankies striker completely bamboozled Brown by knocking the ball around him and running around his other side leaving him an empty goal to tap in to. The goal gave Clydebank a real lift and Jordan Shelvey twice could have extended the lead. The first effort was a result of terrific build up play by McClair, Little and Paterson. The final cross low to the near post was met first time by Shelvey but Brown made a wonderful one handed save. Then, Shelvey showed great tenacity on the left wing by riding a couple of challenges. He had a clear run on goal albeit from a tight angle. He shot rather poorly into the side netting when he should have at least forced a save from the goalkeeper. 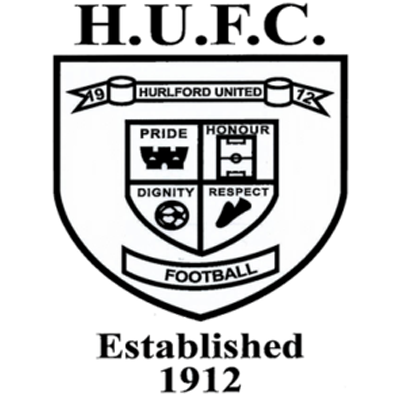 At this point Hurlford looked out of ideas and their case was further dented when Ross Robertson so often the scourge of the Bankies, was sent off for a reckless challenge on Sean Higgins. Robertson’s physical style of play is always going to attract the attention of the referee, and Peter Stuart was in no mood to be lenient. This looked like game, set and match until Ryan Caddis’ fortunate equaliser. Looking at the highlights, given the height of the ball into the box, Marc Waters may feel he should have got to it but it would be harsh to criticise. Overall, it was a fairly even match, but that little rub of the green you need in cup ties went against the Bankies. 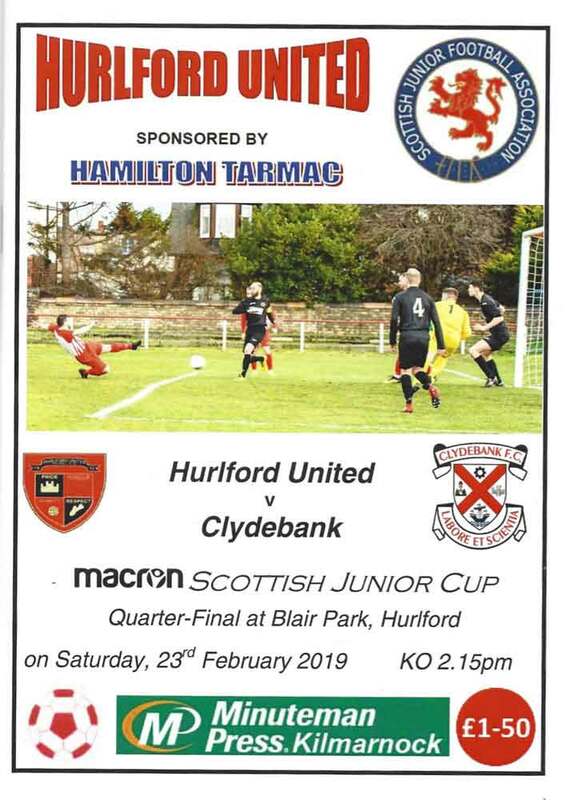 There is no need to fear Hurlford in the replay, but Clydebank definitely need to avoid giving away needless free kicks around the penalty box as this is the Ford’s main threat. In terms of individual performances I would pick out Jordan Shelvey as my man of the match. He is so effective in so many ways with his pace, aerial ability and finishing. He gave the Hurlford defence an uncomfortable afternoon, and when he and Nicky Little are in the mood they are as potent as any front line in the league.